This card stand is a handy way to display your current memory card wherever you will see it most. 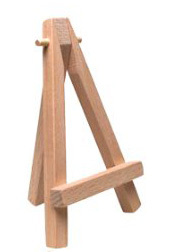 One card or a whole stack of cards fits nicely on this mini easel. Frequently going over the verse you are learning will make memorization progress much faster and retention much stronger.